Optical fiber based sensor systems have fascinated the researcher and tantalized the application engineer for over forty years. The fascination lies within the countless ways through which the technically inclined optical scientist can cause light guided within an optical fiber to interact with the world outside and the myriad principles through which these modulation phenomena could be detected. The applications engineer finds the benefits which this approach offers to be many and intriguing. These include predominantly that the area or point which is to be measured needs no electrical contact and yet remains in intimate proximity to the parameter of interest. Add this to ideas like highly multiplexed all electrically passive networks, distributed sensing systems and interrogation ranges of 10 or more kilometers and a whole new spectrum of applications becomes possible. Of the multiple techniques which have been explored a few have emerged into reality. The fiber optic gyroscope now navigates spacecraft and the hydrophone array helps in mapping the seabed. 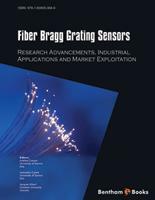 Other techniques are exciting considerable interest and among these one of the principal contenders for extensive exploration is undoubtedly the Fiber Bragg grating – the subject of this book. The Bragg grating is intrinsically a simple device. A periodic structure is written into the core of an optical fiber and this periodic structure will reflect specific optical wave length dependent on the periodicity. Vary the periodicity, vary the wavelength. Since this period depends upon environmental temperature and externally applied strains and pressures we have the basis for a simple sensor which is easily and unambiguously interrogated. Furthermore long strings of these sensors each operating at a different wave length can be written into a single fiber giving an array technology linked through just a single fiber giving an array technology which can extend over kilometers. The basic concepts for the fiber grating go back more than twenty years from early exploratory work undertaken by Ken Hill and his colleagues in Canada. Since then the grating has attracted significant attention from scientists and application engineers alike and has demonstrated its applicability in areas ranging from monitoring large and complex highway bridges to measuring stresses in teeth. This book explores every nuance of this important sensing concept. The contributors are, without exception, internationally recognized experts in their field and present the diversity of techniques, applications and perceptions through which the potential offered by the Bragg grating can be appreciated. This ranges from basic fabrication processes through the design of the details of the grating structure itself into multiplexing techniques and technologies, the interrogating electro-optic system and the numerous interfaces into application. Market prospects and technology roadmaps also feature to complete the overall picture. The book promises to be an invaluable addition to the sensing engineer’s library and will provide essential background to stimulate the future prospects for this important and intriguing technology. The field of fiber optics has undergone tremendous growth over the past 40 years. Initially conceived as a medium to carry light and images for medical endoscopic applications, optical fibers were later proposed in the mid 1960’s as an information-carrying medium for telecommunication applications. The outstanding success of this concept is embodied in millions of miles of telecommunications fiber that have spanned the earth, the seas, and utterly transformed our capacity to communicate and the means by which we do it. The award of the 2009 Nobel Prize in physics to C. K. Kao, who first proposed the use of optical fibers for data communication, is the crowning jewel on this fantastic story. Among the reasons why optical fibers are such an attractive communication medium are their low loss, high bandwidth, electromagnetic interference immunity, small size, light weight, safety, relatively low cost, low maintenance, etc. As optical fibers consolidated their dominant position in the telecommunications industry, the technology and commercial markets both matured, especially from the late 1980s onward. In parallel over the same period, several groups around the world have been carrying out research to exploit some of the key benefits of optical fibers for another very important application: sensing. Initially, fiber sensors were laboratory curiosities and simple proof-of-concept demonstrations. However, more and more, optical fiber technologies are making an impact and have achieved commercial respectability and viability in industrial sensing, bio-medical laser delivery systems, aerospace and military gyroscopes, as well as automotive lighting & control – to name just a few – and span applications as diverse as oil-well downhole pressure/temperature sensors and intra-aortic catheters. This transition has taken the better part of the last 20 years and reached the point where fiber sensors enjoy widespread use for structural sensing and monitoring applications in civil engineering, aerospace, marine, oil & gas, composites, smart structures, bio-medical devices, electric power industry and many others. Of course all these advances have resulted from the development of a complete understanding of the physical and chemical transducing mechanisms and of the appropriate sensor interrogation systems and technologies. For instance, there is a variety of commercial discrete sensors based on Fabry-Perot cavities and Fiber Bragg Gratings (FBGs), as well as distributed sensors based on Raman and Brillouin scattering methods, all readily available along with relevant interrogation instruments. Amongst all of these, FBG based sensors – more than any other particular sensor type – have become widely known, researched, and popular within and outside of the photonics community, leading to a significant increase in their utilization and commercial impact. Given the capability of FBGs to measure a multitude of parameters such as strain, temperature, pressure, chemical and biological agents and many others, coupled with their design flexibility for single point or multi-point sensing arrays and their relative low cost, FBGs are ideal for a multitude of sensing applications in many fields and industries. Since 2000, more than twenty companies have been active in the FBGs sensor market. In 2000, Micron Optics was able to launch in the market the first line of advanced FBG interrogators, while in 2003 LxSix (now LxDATA) and Sabeus launched the first reel-to-reel production of high reliability FBGs arrays. Finally, in May of 2007 HBM – the world’s largest supplier of strain sensing systems – began offering optical strain gages and interrogators based on FBG technology. This marked the first time that a conventional foil strain gage manufacturer adopted and embraced FBGs as an essential part of their product portfolio. A broad and intense commercial pull is expected to follow from this breakthrough. On the research side, many groups around the world are hard at work on new fabrication methods, FBG reliability, new device designs, and new data processing techniques. For instance, FBGs can now be fabricated in many types of glasses using ultrafast IR writing and new post processing techniques have been developed to customize device spectra for enhanced sensitivity in specific applications. New industrial applications have opened up in many strategic sectors, especially in the case of chemical or biological sensing. The prospects of using polymer optical fibers (POF) in sensing applications is expected to lead to the development of POF FBGs for inexpensive, simple and low-cost disposable platforms (in the automotive industry for instance). Similarly, microstructured optical fibers are expected to have a major impact in the development of new chemical and biological systems based on optofluidics as well as active and passive microfluidics. a clear identification of the market situation and a forecast for the next decade. In summary, our goal was to provide a complete, very exciting source of information on FBG sensors for the huge community of people now involved in the field, including both the scientific and the industrial sectors. Of special interest is the fact that the book also contains a very wide range of topics and innovative concepts that have not yet been presented as comprehensive reviews elsewhere. Finally, it is important to remark that each of the chapters has been written by recognized experts in their fields, either from academia or the private sector according to the topic of the chapter. It has been a pleasure for the editors to work with all these authors as they have worked very hard to provide us with authoritative, clear and elaborate reviews of their specialties. We hope that the readers of the book will share our pleasure in reading these reviews, and maybe learn a thing or two along the way to further their research or business. That, surely, would be our most satisfying reward.